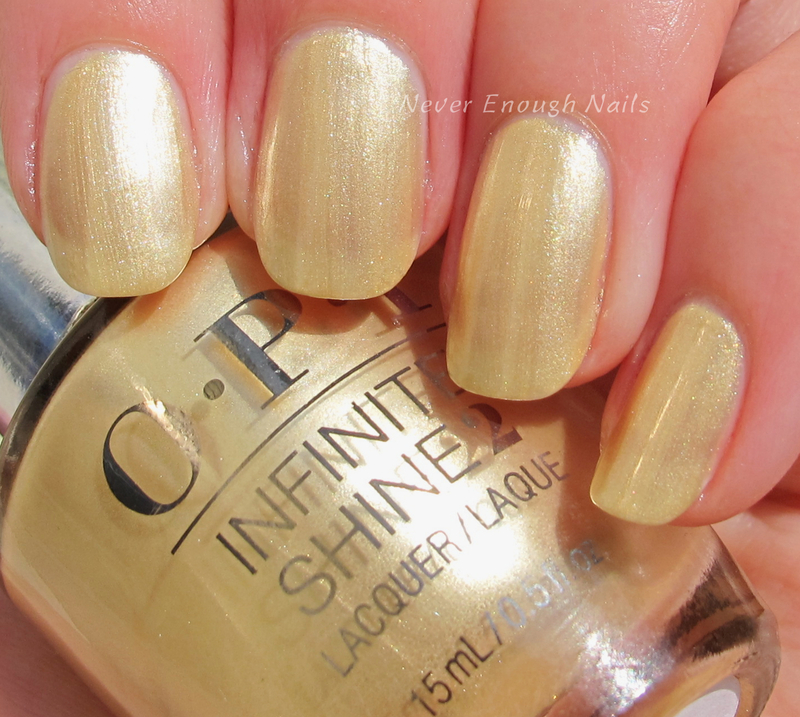 Never Enough Nails: OPI Infinite Shine Summer Collection, Part 2! 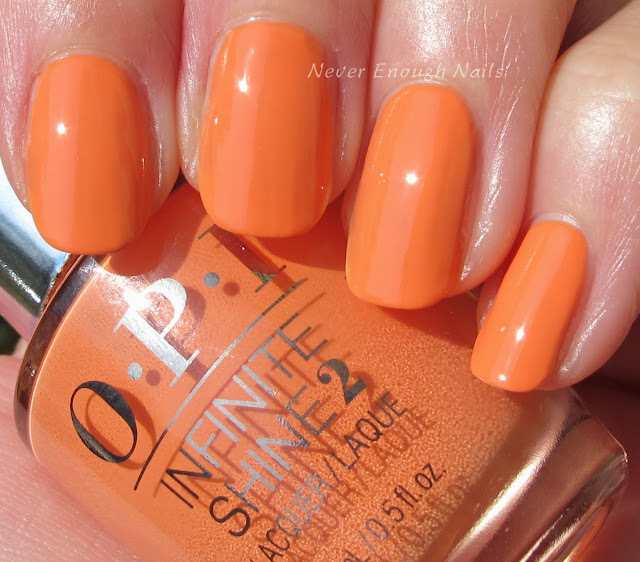 Today I have the second half of the OPI Infinite Shine Summer collection for you. I'm definitely sad to see summer go, so I'll be wearing these bright shades a bit longer! 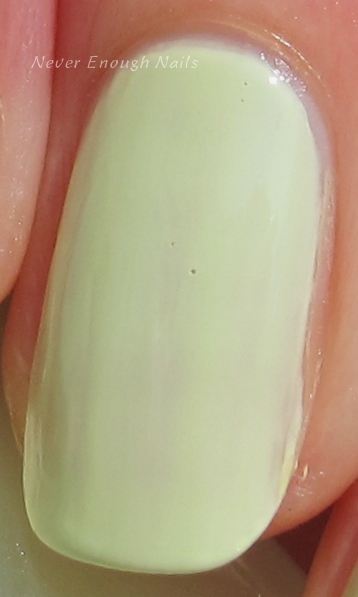 OPI Bee Mine Forever is a pale butter yellow creme. It is saturated enough, but still soft and creamy looking, and reminds me of little yellow flowers! This is two easy coats. Bee Mine Forever has a fantastic formula for a pale yellow. Not streaky at all and very nicely pigmented. OPI Enter the Golden Era is a pearly pale gold. The shimmer in this one is very smooth and glowy. It's a softer gold, not a harsh metallic yellow gold. This is two coats of Enter the Golden Era. It applied pretty well and was nicely pigmented. It did have some visible brushstrokes, but not terrible. This soft pale celery creme is OPI S-ageless Beauty. S-ageless Beauty is a really pale green creme, almost like white with hints of green. It leans more towards yellow-y green, not blue green. This is three thin coats of S-ageless Beauty. Definitely let each coat dry before applying the next coat, as it tended a bit on the streaky side. OPI The Sun Never Sets is a bright melon creme. 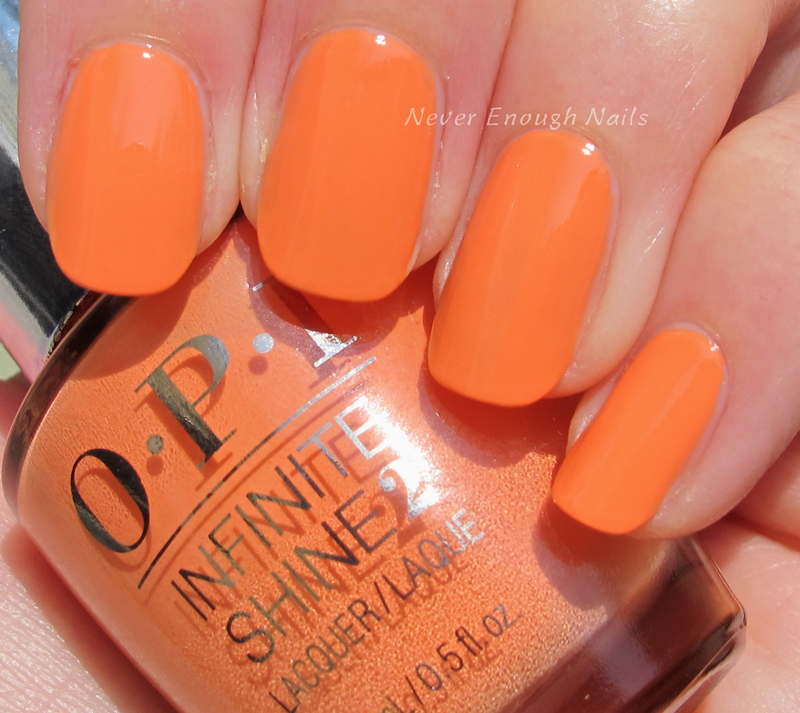 OPI calls it the "afterglow of a tangerine sunset"- pretty description, right? It's a nice orange-peach mix, not too harsh of an orange, but still nice and bright. This is two easy coats. The formula was great and so easy to work with! This pale periwinkle blue stunner is OPI To Be Continued... This is a great pastel blue with hints of lavender. It's not a washed out, soft pastel either, it's brightened up with a healthy dose of white in the base. This is two coats of To Be Continued... It has a great, even formula and lovely pigmentation. If you are searching for the perfect bright blue creme, I have found it for you! OPI Wild Blue Yonder is like the sky on the brightest and clearest of summer days. It's really saturated and the color pops so much! If you love blue cremes like I do, this one is a must have! This is two super easy, flawless coats. You could probably almost do one coat of Wild Blue Yonder, it's that pigmented! The OPI Infinite Shine Summer collection has a lot of great shades to choose from and I think the formulas are mostly fantastic! My top favorites are definitely Wild Blue Yonder and Bee Mine Forever. These beauties are available now at Ulta and professional salons.